Meguiar's Ultra Finishing Polish #205, M20501 - 1 gal. Perfect to use as a second step to refine the paint and enhance the shine. Typically used after Meguiar's M105 as a final step before applying a wax or sealant. You can use M205 with a diual action polisher like the Meguiar's MT300 and a foam polishing pad. You can also use M205 without having to use M105 Compound to remove light paint swirls and to lightly clean your paint. Meguiar's Ultra Cut Compound #105, M10501 - 1 gal. Meguiar's Ultimate Polish - 16 oz. 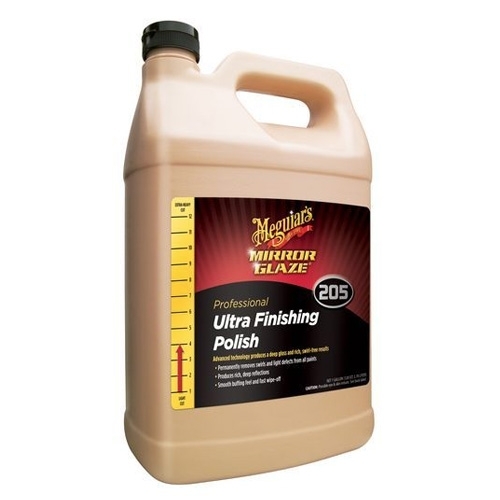 Meguiar's Ultra Finishing Polish #205, M20532 - 32 oz. Meguiar's Self Cleaning Dispenser Bottle, D9916 - 16 oz.